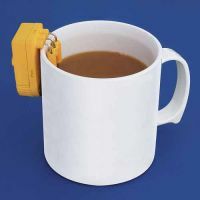 These battery powered liquid level indicators fit over the side of a cup, glass or mug (adjusting to the size of the container) and emit a bleep and/or vibrate to alert blind and partially sighted users when the liquid has reached the required level (RNIB, 2009). 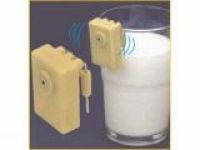 Many have two tones which can be used to give an additional indication when milk is added to a drink that an appropriate level has been reached. 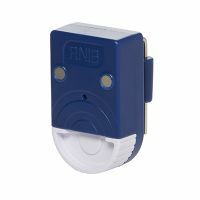 Some are fitted with magnets so they can be stored on the fridge door for easy access. 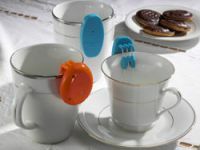 They are suitable for hot and cold drinks. Most of these products assume that the hot water is put in first and then the milk - hence they give one tone when the cup is approximately three quarters full and another when it is nearly full. Alternatively, a few models assume you will put the milk in the cup first and give one tone when liquid raises a little from the bottom of the cup and then give a second tone when the cup or mug is nearly full to avoid an overflow. 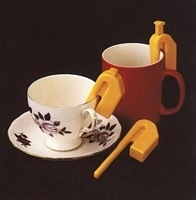 Using a light coloured mug with tea/coffee will give a good colour contrast, which may make it easier to see the liquid level, if you have low vision (RNIB, 2009). The AskSARA Kitchen and vision section, for guided advice about kitchen products related to vision. 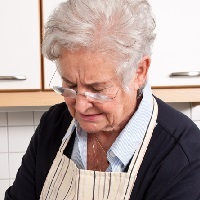 The RNIB who have a cooking information sheet on their website.